UHR high precision laboratory quality bench scale. ISO 9001, Ultra-High Accuracy 30,000 Divisions, Strong, Non Corrosive Cast Aluminum Structure, Large 2" High Backlit Display, Accumulation, RS 232 Interface, Animal Weighing, 110VAC & Rechargeable Battery. Capacity 13 lb to 660 lb. 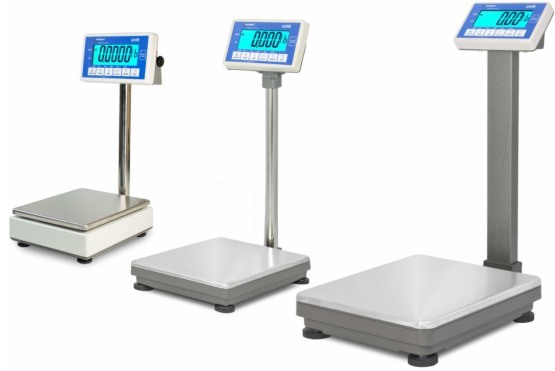 Base sizes range from 11" x 13" to 16.5" x 20.5"
The Intelligent Weighing UHR laboratory quality bench scales are widely considered one of the better values in the weighing industry for high accuracy. As always you can rely on Central Carolina Scale to provide this scale for you with easy ordering and friendly customer service. We're always looking for ways to improve our product line with newer technology and the features that our customer's desire in a product. The UHR Series is no exception. 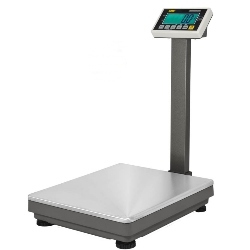 This series satisfies a special position in our range: a bench scale that can truly provide 30,000 division performance in terms of repeatability, return to zero and corner loading. The excellent performance makes this a great product for aerospace, quality control, plastics, research, education and other industrial purposes. The functionality of the indicator is so intuitive that users can be quickly trained in its operation. The huge 2" high Backlit display clearly indicates the measurements. A U-shaped bracket on the versatile indicator allows for various viewing angles. The pillar support can also be removed for stand alone use. The indicator may be removed from the pillar and attached elsewhere to accommodate even more viewing angles. And the corrosion resistant cast aluminum bases provide lightness, stiffness and strength. Configured in three platform sizes; 11 x 13, 13 x 17.7 and 16.5 x 20.5 inches, the capacities range from 6 kg to 300 kg. Pounds, kilograms or grams units are available. 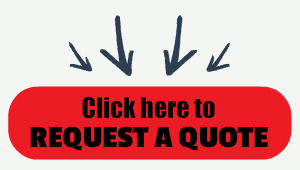 Not only are the materials chosen to give the best performance, but the load cells are specially chosen for their superior performance. The animal-weigh filter ensures a stable weight reading. There is a bi-directional RS-232 output for transferring data to printers or computers and the unit will also receive commands from outside devices. 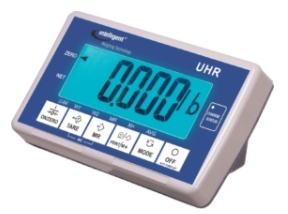 The UHR can perform single-weigh with the print button, or accumulation. The UHR is highly serviceable and can be repaired quickly, unlike many bench scales in the market. Be it in the lab or in the warehouse, the UHR has every benefit of being the most versatile and valuable addition to any industry.